The evening was made possible by the generous sponsorship of the College of Fellows, and Bob Wright, Chairman of the Trustees, was in attendance to congratulate the winners. At its annual Hero Awards ceremony, held in the magnificent setting of London’s One Great George Street on Wednesday 20 June, the CTSI gathered in the late afternoon sunshine with trading standards professionals, MPS and business people to celebrate its heroes of UK consumer protection for 2018. 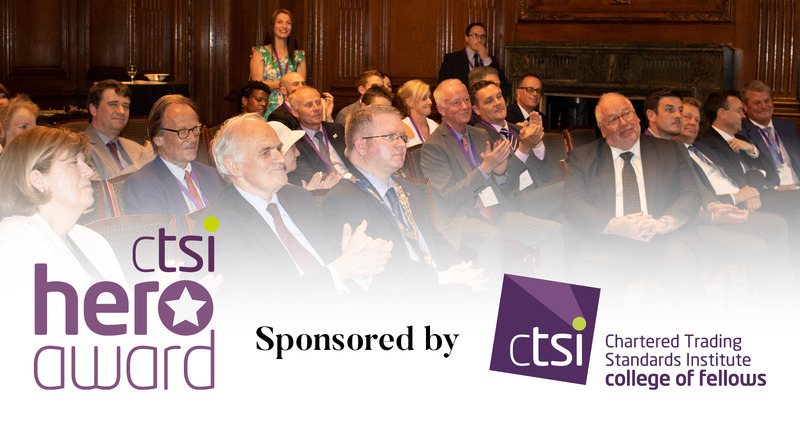 The word ‘hero’ – as the event’s host, CTSI Chief Executive Leon Livermore, pointed out – is one that is easily tossed around, but rarely instantiated. Genuine heroism is all-too-rarely seen, and means courage in the face of adversity, sacrifice for a greater good and willingness to shoulder the burden of real, unflinching commitment to a cause. These are qualities – as my experience at the recent CTSI symposium really brought home to me – that are in evidence across the trading standards profession, so the CTSI had no easy feat in choosing the final winners from the many nominations submitted by trading standards departments around the country. Martin Lewis, consumer champion and founder of MoneySavingExpert.com, who was awarded an OBE in 2014 for his services to consumer rights and charitable engagement for his tireless work in protecting consumers – most recently through founding and funding the charity Money and Mental Health Policy Institute, which helps research, lobby and innovate policies to break the link between mental health problems and debt. Steve Smith, Managing Director and co-founder of trueCall, who designed the innovative scams and nuisance call-blocking service system that has blocked two million nuisance calls in five of working in partnership with trading standards. Neil Butcher, Trading Standards Officer at Kent Trading Standards, was recognised for his exceptional work tackling underage drinking and alcohol related antisocial behaviour, having set up two Community Alcohol Partnerships (CAPs) in Broadstairs and Ramsgate last year, with a third on its way. Animal welfare champion Michael Redfern, who has worked tirelessly to facilitate the removal of animals from premises where animal welfare has been compromised, coming to the aid of trading standards services across the UK, often at short notice to help remove livestock. Simon Skinner, Customer Protection Manager, 45, of Northern Ireland-based RBS/Ulster Bank who has saved consumers £1.2m by safeguarding them from potential scams and worked to train frontline staff in recognising unusual transaction requests, and taking the right actions to protect those at risk. Coventry Building Society was also honoured for its commitment to training and encouraging staff to facilitate customer reports of unusual transactions directly to trading standards services and helping to safeguard members of its communities in Warwickshire, Gloucestershire and Coventry, where it has referred more potential scam victims to Trading Standards Services than any other bank. National Trading Standards, the government-backed body that provides leadership, influence, support and resources to help combat consumer and business detriment nationally, regionally and locally was paid tribute for its special role in enforcement issues that spread beyond local authority boundaries. Perhaps the most poignant awards of the evening, though, were the two winners whose incredible contributions had started when they themselves fell victim to scams. Stevenage-based Maev Dunmore, 70, found the strength after losing £28,500 to a roofing scam to help Hertfordshire Trading Standards put the rogue behind bars, despite deteriorating health and persistent coercion from the scammers. Over a lengthy two-year trial, Maev remained dignified and supportive of her local service, even with the knowledge that she could not recover her lost money. And Leeds-based, Sigrid Hambly, 79, who had previously fallen victim to a prize draw scam, but during a visit from West Yorkshire Trading Standards decided to join the NTS Scams Team’s Mail Marshall Scheme to “share what she had learned about avoiding scams.” Sigrid made it her personal mission to ensure the vulnerable in her community didn’t become victims – even describing it as ‘her job’ – in spite of her personal suffering from mini-strokes. For all the winners, but especially those last two, the word ‘hero’ rather doesn’t seem strong enough.